In 1874, when Northwest Mounted Police Inspector Francis Dickens arrived at Dufferin, an outpost along the west side of the Red River near the Manitoba-U.S. Border, he was angry and upset, first because he had arrived too late to take part in the original trek west, and second because he would have to remain at what he considered one of the most unpleasant places in the entire British Empire. George A. French, the first commissioner of the North West Mounted Police, described the site, where he would assemble nearly 300 people in preparation for a march into Canada’s far west, as a “small shanty town surrounded by a few brothels and grog shops.”  In his memoirs, a young NWMP recruit described Dufferin in similarly unflattering terms. “Dufferin ... was [he wrote] of small account ... a Government warehouse, a Hudson’s Bay Company Store, two whiskey saloons and a few log shanties, inhabited by half-breeds ...”  Contemporary photographs do little to alter these descriptions. They show a collection of unpainted buildings in a muddy, bleak, and untidy setting. Yet it was from this site that two major and very significant events in Canadian history not only began, but also ended. A group of North West Mounted Police in 1874. 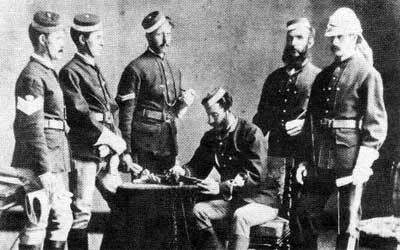 Francis Dickens is standing second from right. The boundary survey was completed in the fall of 1874 and the survey parties returned to Dufferin. In October, the Royal Engineers and most of the men departed the site. In November, Commissioner French, five officers and 55 non-commissioned officers of “D” division arrived back from the Northwest to take up a winter home in the recently vacated barracks. In the spring of 1875 the North West Mounted Police left Dufferin for their headquarters at Fort Pelly. In 1872, Captain Donald R. Cameron became chief commissioner of the British North America Boundary Commission Survey. Arriving at North Pembina, now West Lynne, his first task was to set up a base camp. Cameron selected river lots 31, 33, 35, 37 and 39. The main buildings were constructed on lot 33. Lot 39 was land that Cameron used for himself to construct his home “Emmadale” The land for the camp was purchased from the Renville family, but the land for “Emmadale” was claimed by another Métis family named Gosselin. Until recently, Dufferin, or Fort Dufferin as it is often now called, has remained an obscure and unknown site in Manitoba’s historical community. The only significant attention given to site was the erection of a cairn and plaque by the Historic Sites and Monument Board of Canada in 1949. Now, largely due to the enthusiastic efforts of the Emerson-based Post Road Heritage Group, it is gaining the recognition that it deserves. Organized in 1986 by a concerned group of citizens from the Emerson-Post Road area this group has lobbied hard to see that Dufferin gains its proper place in Manitoba’s and Canada’s history. The first task that this organization undertook was to work closely with the Emerson Detachment of the RCMP, erecting a plaque in 1987 honoring two original members of the force who died at Dufferin in 1874. Additionally, the Group began promoting the site locally through its “Heritage Days” and the development of a hiking and cross-country ski trail from Emerson to Dufferin. Concern for the further development of the site resulted in the commissioning of a feasibility study to investigate and decide how best to proceed. The report concluded that old Fort Dufferin should be developed and recognized as the starting point of the Boundary Commission Trail. The report also recommended that this be accomplished by following and developing an association model. Working with other communities along the Boundary Commission Trail, and with funding from the Manitoba Heritage Federation, the Post Road Heritage Group assumed a leadership role in the formation of the Boundary Commission North West Mounted Police Trail Association. This province-wide association was successful in gaining official recognition of the route from the Provincial Government and the Canadian Permanent Committee on Geographical names. Starting at Dufferin the Boundary Commission/North West Mounted Police Route will be signed all the way to the Saskatchewan border. The most recent development concerning Dufferin was the announcement by the Boundary CommissionNorth West Mounted Police Trail Association that application has been made to designate the area as a “heritage region.” The Association has requested that Heritage Canada name Dufferin and the entire Boundary Commission Trail a Canadian Heritage Region. Currently there are four heritage regions in Canadaone at Labrador Straits, one on Manitoulin Island on Lake Huron, Lanark County in Ontario, and the last on Vancouver Island. The Manitoba project would be the first for the prairie provinces. This announcement is timely as a long range goal of the Post Road Heritage Group is to see the development of an interpretive center at Dufferin. This center would provide visitors with the history of Dufferin and the several themes related to it, and point them west to the other communities throughout the Heritage Region. While this goal is still a few years off, much has been happening at Dufferin in recent years. The Historic Resources Branch of the provincial government has taken an active role and a renewed interest in Dufferin. Over the past three years a preliminary archaeological investigation has occurred. It was through this work that it was discovered that parts of the existing buildings date from 1872. This discovery resulted in the Parks Branch and Department of Natural Resources securing the buildings and the clearing of the site of weeds and undergrowth. In 1991 two events brought further attention to Dufferin. In June, the Town of Emerson and the Post Road Heritage Group sponsored a two day heritage event. This event marked the official reopening of the recently refurbished Emerson Town Hall. Additionally, Dufferin was the site for the Frontier Camp of a black powder group from Brandon, an international canoe derby and two days of entertainment. These events at the Dufferin site helped to further the awareness of the work of the provincial government and the Post Road Heritage Group. In July of 1991 Dufferin was again a staging area, this time for the retracing of the original NWMP trek west. Many visitors and participants from across the country came to Dufferin for the send off on July 10th. As well, media coverage of the event was extensive. This event afforded an even greater opportunity to publicize the historical significance of the Dufferin site and to familiarize the public with the work of the Post Road Heritage Group and the Boundary Commission/NWMP Trail Association. The interest in Dufferin and the awareness of the site has also prompted the formation of a local horse club. This group hopes to use Dufferin for the location of annual horse meets, gymkhanas and amateur rodeos. One such event was held during the last Sunday of September, 1991. The group has also, with the assistance of the Post Road Heritage Group, constructed a corral and show ring in an open area on the site. The horse club also plans to promote riding trails in the area. A boat dock has been constructed on the Red River to accommodate and attract boaters and fishermen. The area’s natural beauty is also an attraction, not only for fishermen and hikers, but for bird watchers and naturalists. It is possible to envision camping and picnic sites on the grounds. In its present pastoral setting it is hard to imagine Dufferin as the muddy, rugged barracks town that it is pictured in the photos and portrayed in the letters of those people who made it their home for a brief time in the early 1870s. Yet, the tranquility of the setting easily lends itself to the imagination. One has to only close one’s eyes momentarily and the sounds and sights of the important history that happened at Dufferin comes back, filling the mind with images of scarlet tuniced riders, hardened Métis scouts and surveyors, and the undaunted courage of those persons who left the sanctuary offered here to face the unknown hardships and uncertainty of the great land to the west. 1. E. Nicol, (ed), Dickens of the Mounted (Toronto: McClelland and Stewart, 1989). A series of letters written by Francis Dickens during his stay in the North West Mounted Police. Although often full of disdain for the physical situation he was placed in, these letters provide an insight into the conditions of the time as well as the character and personality of the writer. 2. G. A. French, Diary, July 8 - November 7, 1874. 3. Barry Potyondi, Dufferin, (Unpublished Report, Historic Resources Branch, 1975) p. 15. This quote was originally taken from Jean D’Artique, Six Years in the Canadian West, (Toronto: Hunter, Rose, 1882), p. 32. Potyondi’s study of Dufferin is very well researched and documented. It provides a substantial amount of information on the role that Dufferin played for both Boundary Commission and the North West Mounted Police march west. Potyondi’s report was used extensively in this report. 5. Patricia M. Badertscher, Fort Dufferin: An Assessment of Its Present Conditions. Unpublished report, Historic Resources Branch, 1984) p. 5. 6. Ibid., p. 7. This description was given by Dr. Willman, Assistant Surgeon with the Boundary Commission. 8. Ibid., p. 8. Also see Dr. John Kittson, Report to the Commissioner, 1874.